It has been very reliable with barely any issues. I like that the 2006 Nissan Sentra is a small compact car yet is comfortable and does not feel to small inside. I have been in smaller cars like the Ford fiesta and felt crammed. I really enjoy having a 4 door car because it is convenient especially for having passengers or kids in the car. The buckles in the back seat to latch child car seats on is a great feature. I thing for the most part it gets decent mileage. It has quite the acceleration which can be nice especially when you pull out into a lane and need to go quicker than expected. I enjoy having the auxiliary port as it is a slightly older car it does easily allow me to plug in my phone to charge or listen to music. When the motor died on our rear driver window though it was difficult to have fixed because there were 2 window models made that year and our car dealership didn't have that distinguished in their system. For a car that is over 10 years old and just over 100, 000 miles it is still running really well. I hope we can keep this car for another several years. We really haven't had any engine problems. The only persistent issue has been with car batteries leaking, even new ones and we don't know why. I think we will look a Nissan again in the future though as a possible car. 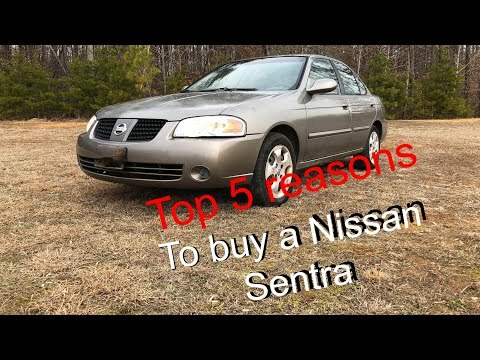 Nissan Sentra reliable and dependable. I bought my Sentra in 2010. It had approximately 100,000 miles on it. I am close to 300,000 miles. Outside of regular maintenance I can not remember any major problems. I am 6 '1 with long legs it can be a little tight for long distance trips. It has been very reliable has never left me stranded. It is not expensive to repair and as long as you keep the maintenance there should be no problems. For long distance trips I would say no more than 2 adults. The rear is sufficient for young children but, came be uncomfortable for adults sitting the rear on long trips. Front wheel drive is good in the snow. I have had to replace the rubber seal in trunk. Power window regulators might need to be replaced. The car is 12 years old that would come under regular wear. It may not be the fastest but, if your looking for reliable transportation. This would be a good choice. A great 2nd car for around town. A good first car your teen or a college student. I will purchase another used Nissan again. It is a reliable car. Great for first time drivers and for single people. My 2006 Nissan Sentra is the 1. 8s sedan version. The car has ran fairly decent over the last 5 years of ownership. The 1st person to own to own it was my older grandmother, who did regular maintenance and didn't drive it much(only in-town driving, not far). With-in my 5 years of ownership, I drove it nearly 8. 000 miles, growing each day, little by little. I do everything at home and only checking once a month. My check engine like has been on and off for 2 years now after an ac belt flew off. Also developed a screech in that time span. Transmission slips, does not like the highways and does not like making it over bridges. Mechanics have looked at it and all told me different things. I suspect a chip issue (replaced 6 years ago) or a new transmission. Over all great, small car, reliable for sure. Especially if maintained regularly. I would if my wallet and growing family could keep up! Nissan North America, Inc. (Nissan) is recalling certain model year 2006 Sentra vehicles manufactured January 2, 2006, to August 26, 2006, originally sold, or currently registered, in geographic locations associated with high absolute humidity. Specifically, vehicles sold, or currently registered, in Puerto Rico, Hawaii, the U.S. Virgin Islands, Guam, Saipan, American Samoa, Florida and adjacent counties in southern Georgia, as well as the coastal areas of Alabama, Louisiana, Mississippi and Texas. Upon deployment of the passenger side frontal air bag, excessive internal pressure may cause the inflator to rupture. Nissan will notify owners, and dealers will replace the passenger air bag inflator, free of charge. The manufacturer has not yet provided a notification schedule. Owners may contact Nissan customer service at 1-800-647-7261. Note: This recall is an expansion of recall 14V-701. CERTAIN PASSENGER VEHICLES EQUIPPED WITH 2.5L ENGINES MAY EXPERIENCE EXCESSIVE ENGINE OIL CONSUMPTION AS A RESULT OF IMPROPER PERFORMANCE OF THE PISTON RINGS. ON CERTAIN PASSENGER VEHICLES EQUIPPED WITH A 2.5L ENGINE, THE CRANKSHAFT POSITION SENSOR CAN OVERHEAT CAUSING A BRIEF INTERRUPTION IN THE SIGNAL OUTPUT FROM THE SENSOR. DEALERS WILL REPROGRAM THE ECM FREE OF CHARGE. CERTAIN MY 2006 ALTIMAS WHICH HAVE BEEN PREVIOUSLY REMEDIED UNDER RECALL CAMPAIGN 06V223 (NISSAN R0606) ARE NOT INCLUDED IN THIS RECALL SINCE THE REPROGRAMMING FOR 06V223 ALSO INCLUDED THIS REPROGRAMMING. THE RECALL IS EXPECTED TO BEGIN ON OR ABOUT DECEMBER 10, 2007. OWNERS MAY CONTACT NISSAN AT 1-800-647-7261. Nissan North America, Inc. (Nissan) is recalling certain model year 2004 Pathfinder vehicles manufactured January 6, 2004, to July 19, 2004, and 2004-2006 Sentra vehicles manufactured January 7, 2004, to August 26, 2006. Upon deployment of the passenger side frontal air bag, excessive internal pressure may cause the inflator to rupture. Nissan will notify owners, and dealers will replace the passenger air bag inflator, free of charge. The recall is expected to begin on June 15, 2015. Owners may contact Nissan customer service at 1-800-647-7261. Note: This recall addresses vehicles that were not included in the regional recalls of 14V-701 and 15V-226. Those two recall campaigns address vehicles sold or ever registered in certain areas of high absolute humidity. This recall addresses the remainder of the vehicles sold or registered in the remainder of the U.S. and its territories. CERTAIN (36-58 PASSENGER) MOTOR COACHES FAIL TO COMPLY WITH THE REQUIREMENTS OF FEDERAL MOTOR VEHICLE SAFETY STANDARD NO. 101, "CONTROLS AND DISPLAYS." THE PARKING BRAKE INDICATOR LAMP ILLUMINATES IN GREEN AND NOT RED, WHEN THE PARKING BRAKE IS ENGAGED. ILLUMINATION IN RED IS REQUIRED BY THE APPLICABLE STANDARD. DEALERS WILL INSTALL APPROPRIATE SOFTWARE TO CHANGE THE COLOR OF THE PARKING BRAKE INDICATOR LAMP FROM GREEN TO RED. THE RECALL IS EXPECTED TO BEGIN IN MAY OR JUNE 2005. OWNERS SHOULD CONTACT SETRA AT 1-800-882-8054.